In case you haven’t heard, we are launching the V-One Drill! An attachment to the V-One that will make the creation of double sided boards a breeze. Check out all the details here and read our blog post to learn more. 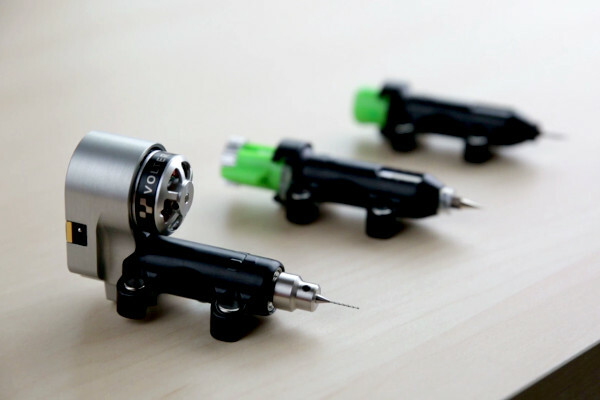 The V-One Drill ships with a bunch of accessories and has a limited time price of $499 USD until March 31st. looks nice - thanks for the update. What will the normal price be? @Steven_Hines - Whoops! That’s embarrassing, I’ve corrected the url. Thanks for pointing it out. I got my V-One drill in today and gave it a quick test drive. The drill itself is great. Compact, super quiet, really nice. The workflow for drilling is also nice, easy to follow, etc. Switching drill bits is simple and fast. The ability to use an already-existing alignment after drilling is a huge improvement. Overall, this drill makes 2 sided boards incredibly easy to build. Very, very happy with it. Because I didn’t follow the walkthrough with the demo board, I missed one important thing: you need to use the 1.6mm drill bit for through holes so that the 1.0mm rivets fit; seems obvious now. When drilling multiple sizes in one drill operation, after the drilling holes for the first size, the prompt to drill the holes for the next size is “Re-drill?” instead of just “Drill” like it was the first time. The “re-use alignment” selection is triggered only when using the same exact files for the subsequent operation, and the last files you selected is remembered per workflow. So, if you Drill with one pair of files files and then go to Print and choose “load last files” and these are different files than you just drilled with, you’ll lose the ability to re-use the alignment from your drill operation. There are a few little tools to keep handy (hex wrench, rivet tools) with the drill, so a holder for these would be nice to have. Probably something that could be 3d printed easily enough. Anyway, kudos to Voltera for doing such a great job with this drill! That’s great to hear! Thank you for the feedback! This sounds like there’s a bug in there. It should only say ‘Re-Drill’ if you for some reason want to drill more holes of the same size. A brand new size should say Drill. I can 100% see this happening to many people. Losing your alignment to this is annoying. Right now the ‘Load Last Files’ button remembers the last file in used in that workflow, perhaps a ‘Load Last Folder’ might make more sense. Looks like we’ve got some homework to do. Out of curiosity, did you use the rivet tutorial at all? If so, were there any confusing/unclear steps? Yes, I did follow the Rivet tutorial before trying any rivets on my board. It was easy to follow and it worked great. It took a bit of practice to get the hang of the .4mm rivets but after that it went quickly. I used an FR4 board of equivalent size to place against the board after I placed the rivets, before flipping to press the rivets. Anyway, I placed and pressed 18 rivets in just a few minutes. I consider myself extremely lucky to have bagged a V-One KickStarter early bird at $1,199 USD. I had wanted to add a drill as I feel it will add a lot of value to the overall usefulness but at just under $1,000 Cdn it is a little out of my reach this point. Maybe someday, I can pick up a used one.